OMG...We did it!!! Newquay Sea Safaris and Fishing won Gold at the prestigious Cornwall Tourism Awards last night , hosted at the iconic and our favourite hotel..The Headland Hotel. Tonights the big night. Newquay Sea Safaris and Fishing are Finalists for the Cornwall Tourism Awards sooo..tonight we discover WHO have won the Bronze, Silver or Gold award for the Wildlife and marine Attraction of the Year 2014-2015. Gorgeous Pregnant Female Grey Seal hauled out on rocks during sea safari today during which we released another 3000 Lobster Larvae from the Padstow Lobster Hatchery. Well what a week...there has been a massive Jellyfish Hype with Barrel jellies being the main star of the show..the BBC, Sunday Times, Childrens' BBC and Skye T.V...all filming off "Atlantic Diver" in Newquay Bay this week...phew ..no pressure to find them then!! This Amazing SHARK ...was caught whilst on a fishing trip off Newquay on board "Atlantic Explorer" today. Skipper Derek Applewhite said it was about 5 feet long and weighed approximately 35lbs. The anglers were only a short distance offshore when the chance catch happened as they were trying to catch any bottom fish species such as pollack and cod. They were using mackerel as bait. We had an immensly enjoyable Sea Safari for the St Agnes Marine Conservation Group this week. The sun was shining all the way to St Agnes and all manner of Breeding Sea Birds were out including this Bridled Guillemot. Its the first time I've seen one this far West. It was sitting on the ocean in a small raft of Guilies just waiting to be spotted. 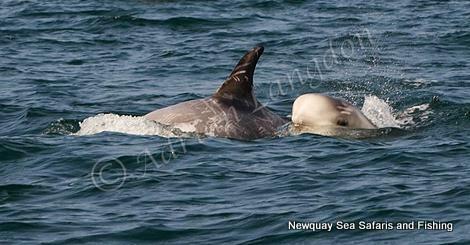 Our sighting has been sent off to the Cornwall Wildlife Trust as we are a Master Wise acredited boat operator. Newquay Sea Safaris and Fishing Boat Trips are going out every day now (weather permitting) . Crew and passengers of both "Atlantic Diver" and "Atlantic Explorer" have been enjoying the incredibly beautiful sunshine which has been bathing the Newquay coastline in glorious sunshine. Newquay really has been living up to her title of "Coast of Dreams"
I just thought I would share with you this beautiful picture of trunk from today. She is a semi resident seal that reguarly comes into Newquay Harbour. This was taken at the stern of our boat "Atlantic Diver" while we waited to get moorings after a beautiful calm Sea Safari with some fabulous passengers.